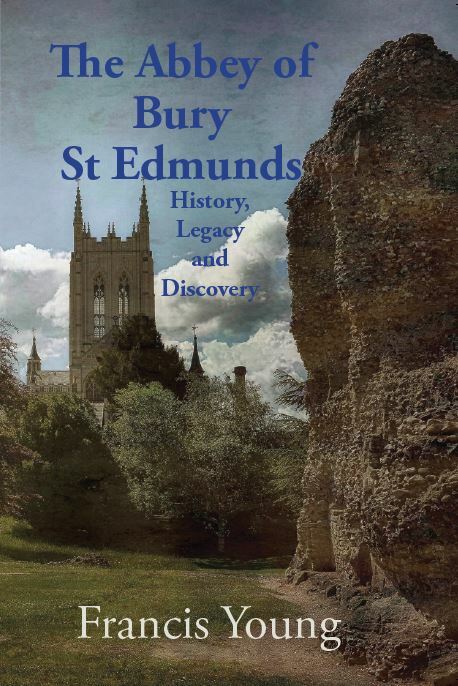 Today is the publication date of my new book The Abbey of Bury St Edmunds: History, Legacy and Discovery, which is the first complete history of East Anglia’s greatest abbey from foundation to dissolution. This evening I launched the book at St Mary’s Church, Bury St Edmunds. I was especially pleased that the Sacrist of the modern-day St Edmund’s Abbey, Dom Hugh Somerville-Knapman, was able to be there as a representative of the monks. I am grateful to Rev. Malcolm Rogers and St Mary’s Church for hosting the event in association with my publisher, Lasse Press. To those who already have an interest in the history of Suffolk and Bury St Edmunds the appeal of a history of the great Abbey is, I trust, obvious. However, the Abbey of Bury St Edmunds was not just another large medieval English abbey. The Abbey’s significance was national, in the first instance, because it was an active symbol of the difficult and complex construction of a composite Anglo-Danish Christian identity for the people of the Danelaw, the mixed descendants of the old Kingdom of East Anglia and Viking invaders. The centrality of the shrine of St Edmund ostensibly sent a message about the ultimate victory of English Christian over heathen Dane, and this may have been the ideology behind the translation of Edmund’s body to the town of Beodricesworth (the future Bury St Edmunds) at the beginning of Æthelstan’s reign (c. 904). However, the Abbey itself was apparently founded by the Danish king Cnut, only six years after his father Sweyn was supposedly killed by the spectre of St Edmund. Thus, the Benedictine foundation represented an act of reconciliation between Englishman and Dane whose significance extended far beyond Suffolk or even East Anglia. The Norman Conquest sharpened Bury’s significance as the shrine of the patron saint of the English people; ironically, owing to its French abbot (Baldwin), Bury did not suffer any of the depredations of the Conquest and only grew in importance. William I, by siding with the Abbey against the Bishop of Norwich, performed an act of reconciliation not dissimilar to that of Cnut; St Edmund presided over the merging of English and Norman identities in the new polity of the Norman Conquest. Indeed, throughout the Middle Ages Bury was the guardian of a specifically English identity; Edward I repeatedly visited the Abbey to and from his expeditions against the Scots, praying at St Edmund’s shrine for an English victory, and both Edward I and Henry VI insisted on receiving the submission of Welsh princes at St Edmunds. The significance of the Abbey to the story of Magna Carta is well known, as is its role in the development of medieval English anti-Semitism. Understanding the Abbey of Bury St Edmunds is crucial to understanding the formation of an English ‘national’ identity in the Middle Ages, as far as such a concept makes sense before the advent of the modern nation state. Until now, however, there has been no complete history of the Abbey available. The first published history of the Abbey of Bury St Edmunds was written in Latin by John Battely (1647-1708), Archdeacon of Canterbury, in around 1691, but it remained unpublished until 1745 – and, in any case, Battely told the story only up to 1272. In 1805 Richard Yates, a clergyman who had been brought up in the ruined West Front of the Abbey, brought out the first volume of a two-volume work entitled An Illustration of the Monastic Antiquities of St. Edmund’s Bury; the second volume was published posthumously in 1843. Although richly illustrated, Yates’ book was more of a collection of antiquarian documents than a complete history of the Abbey from foundation to dissolution. The next attempt at a complete history of the Abbey was Albert Goodwin’s The Abbey of St. Edmundsbury (1931), but this was really no more than a short pamphlet publication of a prize essay. Then, finally, in the early years of the twenty-first century the veteran historian of the Abbey, Antonia Gransden, produced two monumental volumes on the Abbey between 1182 and 1256 and between 1257 and 1301. Although Gransden had originally intended her volumes to cover the entire history of the Abbey, she was forced to give up on this ambition owing to the vastness of the task. As a consequence, until today no complete book-length history of the Abbey from its putative foundation in 1020 to its dissolution in 1539 existed, although historians as eminent as Thomas Carlyle, Thomas Arnold, M. R. James, Diarmaid MacCulloch and Antonia Gransden had turned their attentions to different aspects of the Abbey at various times. Part of the problem has been that certain periods in the Abbey’s history – such as the richly documented reign of the famous Abbot Samson – have attracted disproportionate attention in comparison with other eras. My book provides a narrative history of the Abbey’s entire history, supported by detailed references to the secondary literature so that those who wish to investigate the Abbey’s history in more detail can do so with ease. My aim is to provide a synthesis of all the historical work undertaken on the Abbey, ensuring that there is a single port of call for all embarking on the study of the Abbey, as well as an accessible introduction for the non-specialist. This entry was posted on September 8, 2016 by jacobite.